Internet explorer password recovery and windows application password unmask tool is easy and safe to use password recovery software utility that recovers lost or forgotten internet explorer saved passwords including for E-mail logins or Newsgroup account, Online shopping, Search engine, Magazine subscription, Web forms and other password protected applications. Similarly restore Internet Explorer saved passwords including FTP (File Transfer Protocol) passwords, IE Auto Form and AutoComplete fields, AutoComplete passwords and similarly the Identity password (Multiple user account passwords). The wizards include support for all major versions of Internet Explorer and provide easy way to manage and show the password instantly. Just drag the mouse pointer on any password dialog box and unmask and reveals hidden (*****) passwords. The Software is simple easy to use with GUI interface and unhide all hidden password in seconds time with multilingual password support on Windows Vista, XP, 98, ME, NT 2000 and 2003 machines. Recover all lost or forgotten internet explorer saved passwords. 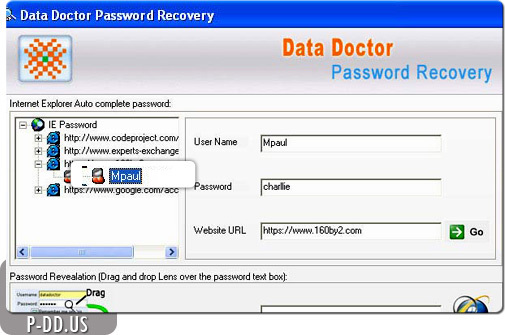 Restore FTP passwords, IE Auto Form and AutoComplete fields, AutoComplete passwords and similarly the Identity password. Support all major versions of internet explorer. Fully support multilingual Password Recovery. Provide easy way to manage and protect the user password ever entered on your computer PC. Simple and easy to use with user friendly interface!